Clare B. Dunkle was born Clare Buckalew and grew up in Denton, Texas. She earned a B.A. in Russian with a minor in Latin from Trinity University in San Antonio and worked in Trinity University's library after earning her M.L.S. from Indiana University. For seven years, she and her family lived in the Rheinland Pfalz region of Germany not far from the Roman city of Trier. Her daughters attended a boarding school there and read her first four books as a series of letters from home. Dunkle's debut novel, THE HOLLOW KINGDOM, won the Mythopoeic Award for Best Children's Fantasy Book in 2004. Her books have earned spots on a variety of "best book" and "core" lists, including three Bank Street nods, and her fiction has earned starred reviews from Publishers Weekly, Booklist, and The Horn Book. 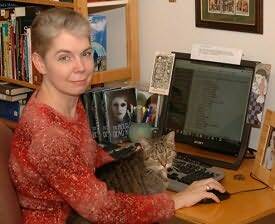 She lives now in San Antonio, Texas, where she writes dark fantasy and science fiction for teens. In her spare time, she reads Victorian ghost stories.